Life Size Realistic Four-Foot Long SWAMP ALLIGATOR CROCODILE PROP Vinyl Over Squishy Poly Foam with Hollow Bottom. Perfect Luau Decoration, Mardi Gras celebration, Pirate themed Birthday party, haunted house, Halloween event. 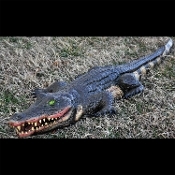 Realistically scary detailed large size lizard Gator Croc jungle wild animal garden pond yard decor. Realistically detailed FANG-tastically ferocious SWAMP ALLIGATOR JUNGLE CROCODILE will startle and scare visitors with a touch of frightfully fun large size lizard safari wild animal theme home decor. Big GATOR is a surprising addition to bathtub, kiddie pool or shallow yard garden pond for your next party! *NOTE: Gator does NOT float, and cannot be used as a flotation device. One piece construction, easy to set up. At approx. 4 feet long, he even looks like the real deal, complete with excellent color and detailing! Made of Vinyl Over Squishy Poly Foam with hollow bottom. Material: Vinyl Over Squishy Poly Foam.